If you love chocolate and you love peanut butter, then you’ve probably had a Reese’s Peanut Butter cup – the perfect blend of peanut-ty, and chocolate-y flavors combined in a short, muffin-like package. As a child, I grew up with the Original Reese’s Peanut Butter Cup. Since then, Hershey’s has launched a few more ways to eat the great Reese’s flavors. They now offer not only the original Reese’s Peanut Butter Cup, but also a Dark Chocolate Reese’s Peanut Butter Cup, the Reese’s Big Cup, Reese’s Pieces, and many more types of Reese’s. We had the opportunity to try the original and Dark Chocolate Reese’s Peanut Butter Cup, a Reese’s Big Cup, Reese’s Pieces, and a Reese’s Crispy Crunchy. It was hard to choose a favorite between the different types of Reese’s products because they were all so good. First up, was the Reese’s Big Cup – since we only had one, we decided to do rock, paper, scissors to determine who would get to eat the big one. Having that extra bit of peanut butter was worth fighting for! I loved the twist to the cup that came with the dark chocolate. I was surprised that the dark chocolate flavor was so distinct in the Dark Chocolate Reese’s cup while still blending well with the peanut butter flavor. The other testers quickly gobbled up the original Reese’s Peanut Butter Cup, which has the tried and true combination of milk chocolate and peanut butter. I think that the Reese’s pieces are my favorite, though. I love the convenience of the tiny pieces that you can just keep pop, pop, popping in your mouth. They don’t have chocolate but the peanut butter flavor is wonderful as a stand-alone flavor. Finally, there’s the Crispy Crunchy, which is a chocolate covered, crispy bar of peanut butter, peanuts, and peanut butter candy. To celebrate America’s love for it’s number 1 selling candy bar, Reese’s Peanut Butter Cups is trying to make May 18th I Love Reese’s Day. With National Peanut Butter Day in March and National Chocolate Day in July, May is the appropriate time for I Love Reese’s Day, honoring the wonderful combination of both flavors. From now until May 17, 2010 fans can visit www.ILoveReesesDay.com to sign an online petition to declare May 18th I Love Reese’s Day. As part of theI Love Reese’s Day celebration, Reese’s will randomly be giving away Reese’s Peanut Butter Cups to up to 10,000 visitors of www.ILoveReesesDay.com. I Love Reese’s Day will also kick off their Reese’s Loves You Back campaign that gives Reese’s Peanut Butter Cup lovers a chance to win up to $2 million in cash prizes between June and December 31, 2010. Reese’s are currently sold in grocery, drug and convenience stores nationwide. For more information about Reese’s, please visit www.reeses.com. THIS ENTRY IS REQUIRED FOR ALL OTHER ENTRIES TO BE VALID (+1): Remember to post this as a comment. 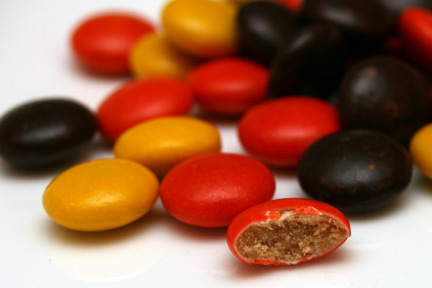 Visit www.Reeses.com and tell me which Reese’s product you like the best or would like to try. Two winners will be selected at random for this prize. Giveaway ends at 11:59 PM EST, May 23, 2010. Disclaimer: This post consists of my (and/or fellow tester) opinions only. No compensation was given for this review/giveaway. I did receive free Reese’s products from the manufacturer or representing PR agency to use and test for the purposes of this review. This did not affect the outcome of this review. The Original Reeses cups are my all time favorite. I'm an e mail subscriber. I love the Reese's pieces! I would love to try the NUTRAGEOUS candy bar! I want to try the Reese's Select Cluster..I've never seen them before, and they look delicious! Reese's Pieces are my fave. I'll be creative and go with nutrageous however I love the original cups frozen! 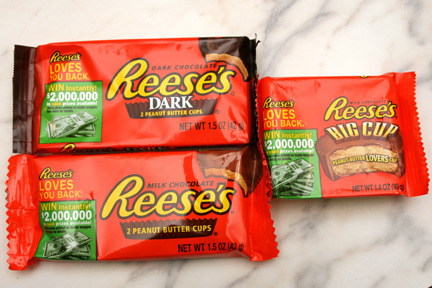 I would like the Dark Reese's Peanut Butter Cups the best. I signed the Reese's petition. I'd like to try the Reese's Dark Chocolate Peanut Butter Cups. Thanks. Favorite Reese's snack is easy, it's Reese's Pieces! I want to try the Reese's Dark Peanut Butter Cups. I'd like to try Reese's Sticks. I like a little crunch with my candy! Reese’s Big Cup Peanut Butter Cups! I like the original reeses peanut butter cups. I love Reese's Cups the best. I have had the Reese’s Dark Chocolate Peanut Butter Cups and they are purely amazing!! I love the Big Cup! I love Reeses Dark Pieces! The Reese's Select peanut Butter Creme looks great but I am a purist, The orginial is the best. The original Reese's cups are my favorite!!!! I love Dark Reeses Peanut Butter Cups. You can't go wrong with the classic Reeses cups. I am a DARK chocolate kind of girl, so those would be my choice. Reese’s Dark Chocolate Peanut Butter Cups! I have already signed the Reese's Petition. Reese's Pieces are my fave!! Reeces Pieces is my favorite! I would love to try their Reese’s Dark Chocolate Peanut Butter Cups. I love their reese's pieces!! I'd like the Heath Bars! I would like to try Reese's Select Clusters. I love the regular Reese's Peanut Butter Cups best. I would like to try the Reese’s Select Peanut Butter Cremes! I would really like to try the dark chocolate peanut butter cups. But, I can't find them in the stores here…. I love all things Reese's!! I'd love to buy one of the tins of miniature Reese's Cups from the website. I like the Dark Chocolate Reeses the best!! When did Reese's come out with all the different kinds of PB items?…I want to try a bunch especially the Reese's Select Cremes, Reese's PB Cups with Caramel and White Reese's PB Cups, yum, yum and yum! I'd like to try the REESE'S NUTRAGEOUS candy bar. Thanks. i want to try the dark chocolate cups! I love Reeses and am intrigued to try their dark chocolate idea. My favorite Reeses is the orgional milk chocolate peanutbutter cup. I would love to try the Reeses Dark. My favorite is the Reese's Peanut Butter Cups. I love the reese's peanut butter cup minis! 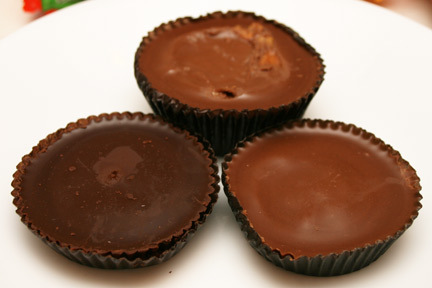 I love the Dark Chocolate Reeses Peanut Butter Cups….anything dark chocolate is awesome! The regular Peanut Butter Cups are my favorite – but what version of chocolate and peanut butter isn't good? I would love to try the Reese's Select Peanut Butter Cremes! I'm a Reese's Pieces girl. There is nothing better than the original Reese's peanut butter cup – two to a pack! My favorite has always been Reeses Pieces. I'd like to try the Sweet and Salty granola bar with Reeses. 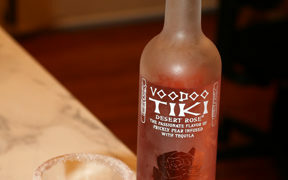 Now THAT'S what I call “health food”!Thanks for the contest! I'd like to try the Sweet and Salty granola bar with Reeses. Now THAT'S what I call “health food”! I didn't know there are caramel peanut butter cups, that would be so yummy. I'll have to check the grocery store tomorrow. I'd like to try the “Dark Chocolate Reese’s Peanut Butter Cup”. Thank you for the chance to win. I visited Reese's and my favorite product is Reese's Pieces. I like so many of their Hershey products. I picked the Snacksters. i like you on facebook. my name: sarah u.
I would love to try Reese's DARK chocolate peanut butter cups! I like Reese's Pieces best. 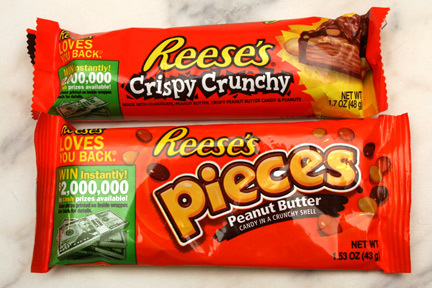 Reese's crispy and crunchy bar. I like the regular Reese's peanut butter cups. the reeses dark looks yummy! Reese's Select Clusters sound great! I've never seen them in a store!Thanks for the giveaway! Reese's Select Clusters sound great! I've never seen them in a store! I like the Dark Reese's Peanut Butter Cups best. Reese's Pieces are my fave! I want to try the Reese's Big Cup! I tried the dark chocolate last week and it was awesome! I enjoy the bigs cups, and the reese's pieces! I love the holiday Reese's – the pumpkins and Easter eggs! Reeses Dark. I would love for them to bring back the inside out peanut butter cups. I love Reese's Fastbreaks, thanks! I really like the new Reese's Dark chocolate! i'd like to try the crispy crunchy bar! I want to try the peanut butter cups with caramel. I love regular ol' Reese's Peanut Butter Cups the best. It really is two great tastes that taste great together. I have to stop myself from eating too many of them when we buy a bag. I like them all but my favorite is the regular Reese's Peanut Butter Cup.